Writing Disciplines for New Believers ("DfNB") was a wonderful experience. If you are interested in "discipling" a new convert, then this is one book that you may want to consider. 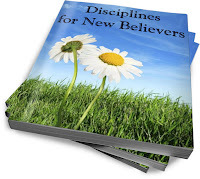 DfNB is an eight week devotional booklet with a special emphasis on Baptist Distinctives covering a wide range of topics: Baptism, Communion, Tithing, Witnessing, and so much more. I also included a summary of several recommended basic Bible study tools for the serious student of the Bible. You can read a little bit more about my book here. I trust this will be a blessing to many who are interested in learning more about God and His Word.